Disability Justice welcomes Mr. Anthony D’Angelo as an associate Social Security disability attorney in its Philadelphia office. He is a recent graduate of Drexel University’s Thomas R. Kline School of Law. D’Angelo’s passion to help others developed at an early age. His father, a chiropractor, would frequently discuss the difficulties patients face, such as chronic pain and the lengthy wait times to be approved for Social Security disability benefits. D’Angelo also witnessed a family member’s long struggle to receive Social Security disability while continually managing disabling conditions. 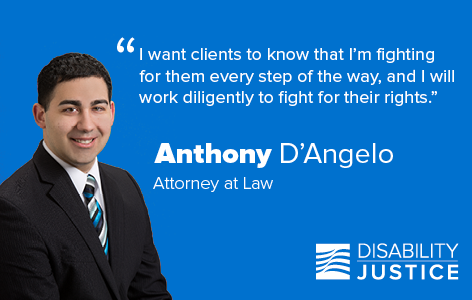 As a Social Security disability attorney, D’Angelo strives to use the law to help those struggling with disabling medical conditions secure the benefits they deserve. D’Angelo can be reached at adangelo(at)disabilityjustice(dot)com.